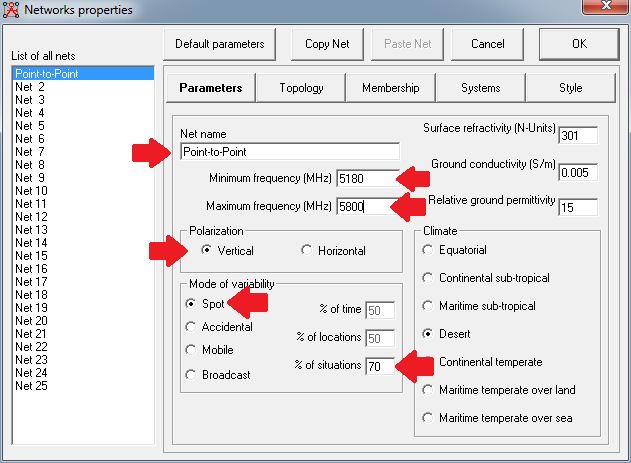 This tutorial will cover the creation of your first 5.8 ghz network with a single point to point link. You will learn how to create units, set network parameters, and create a point to point link profile. You will be prompted to erase the current network, since this is the first run you can proceed. You will be presented with a "New Net initialization" screen. For now, let us stick to the default values. Once the new network has been created, save it on your hard drive: Click on File->Save Networks As, and choose your save location. This will be the location where any additional files related to your network will be saved as well. I use c:\radiomobile\networks for mine. Each unit is a single wireless radio/antenna combination. 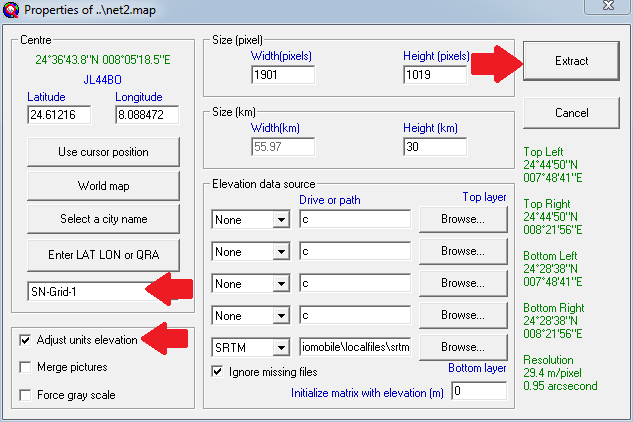 So in order to map a full highsite, you will have multiple units at a specific set of coordinates. For now we will start with a simple Point-to-Point link and expand from there. For the sheer fun of it, we will be plotting links for the fictitious WISP, SaharaNet. You can download the Google Earth file HERE. 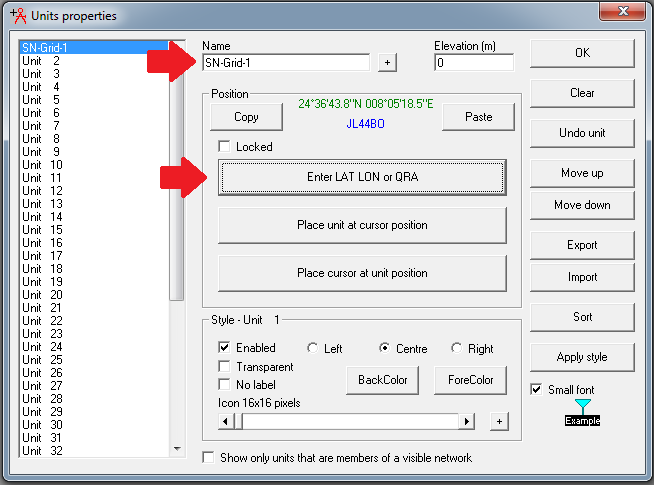 Click on "Enter LAT LON or QRA" alternatively you can copy the placemark in Google Earth and simply click on "Paste"
Enter the Latitude an Longitude for SN-Grid-1. Give this network a name, I will use "Point-to-Point" because it makes sense in this tutorial. In production you would want to give it a name that makes it uniquely identifiable. Tick the bottom boxes, they are self explanatory. We will skip ahead and come back to Membership later. Select System 1 in the left hand pane. Make sure that the two units we created earlier are selected. Leave the rest on default settings. 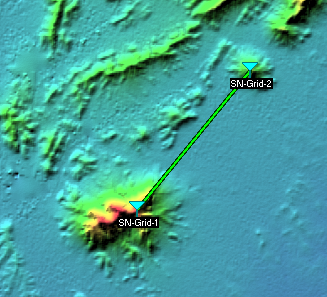 Select SN-Grid-1 to center the map on. 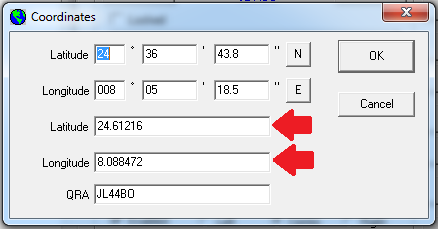 Adjust the size (pixel) so that you know it will fit on your screen, and the Size(km) so that it will include both units. If this is the first time you are creating a map, it will proceed to download the map data from the online sources. You will now see the link plotted on the map. The settings we applied in "Network Style" determines that the link color will be green since it is above the threshold. 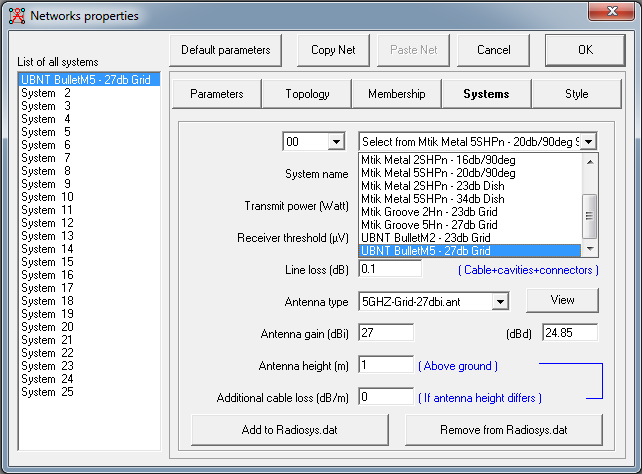 You will now be presented with a beautiful radio link profile, it will provide you with all the details re. the link. In this case it estimates that you will have a SNR of 41.1dB provided that there are no buildings or other obstacles in the way, and that it is a zero noise environment. Since this is out in the middle of the desert, I think it is safe to assume that these estimations are very accurate. Remember that link modelling does not replace a good old fashioned site survey. Check back soon for more RM tutorials! I have contacted Mikrotik to get some antenna pattern files, if they cannot supply, I will try to make my own.